The floating notes window is a feature which TheBrain 8 has but TheBrain 9 does not have and it is very useful. With the advent of Windows 10 the floating notes window functionality was broken by Microsoft with the screen scaling factor. If the screen you dragged the notes window to was a different scale factor to the screen which TheBrain was open on then the system crashed. But with the latest update to Windows 10 this problem has been solved, the user needs to set the 'Override High DPI scaling behaviour' in the Compatablity tab of the program properties and set the 'Scaling performed by' drop down to 'System' and everything works correctly. I believe this crash was the reason the floating notes window functionality was left out of TheBrain 9 but now the problem is solved there is no reason not to include it. 1. This bug was caused by screen scaling which was introduced by Windows 10 so anyone using a previous version of Windows will not be affected by it. 2. The updates for Windows 10 are mandatory so 99% of people using Windows 10 will have been updated to the fixed version. 3. The function has already been implemented in TheBrain 8 so a working example of the code already exists. Having a floating notes window on a multi monitor system is incredibly useful so please consider this feature request. The lack of this feature is the thing which is preventing me from transferring to TheBrain 9. Until this feature is implemented, you can drag out a tab (to make it a new window), resize the window and maximize the notes area. I do this all the time. Yes that sort of works but the notes window (i.e. the new wondow) is not synchronised with the node which has the focus. With a floating notes window it displays the notes of the thought which has the focus and changes when a new node gets the focus. Thats why TheBrain 8 is still better than TheBrain 9. You can also set a keyboard accelerator under Thought to Open to a new Window. This will automatically open a new window with the active or hovered thought, removing a step. Still won't change to a new node though, which is why I'm offering it as a workaround not a solution. Um, ok. Just trying to help a fellow forum member out. Sorry I wasn't trying to be aggressive. Just pointing out that I won't be moving the bulk of my notes to TheBrain 9 until this feature is implemented, I suspect I may be waiting a while! I agree that the floating notes window is extremely useful and very desirable feature to have, especially when using multiple monitors; not having this feature made me greatly affected my work flow, making me return to using Brain8. Please resurrect the floating notes window for MacOS! So TheBrain 9 has been released without a floating notes window. This is a MAJOR feature of TheBrain 8 which is missing from TheBrain 9. Yes there was a bug in TheBrain 8 which creashes the program on Windows 10 if the screens are set to a different scale factor but to react to a bug by taking out the functionality seems ridiculous. Other programs have adapted to the screen scaling of Windows 10, they fixed the bugs . Thank you for posting. I'll be sure to document your feature request to keep a floating notes window synchronized with the current active Thought. I finally made the move and upgraded to TheBrain 9 yesterday! (Still familiarizing with the new version). I just realized that a right click (under window) on the top of the editor menu you get the option to open the editor in a new (floating) window ! What's still missing is the ability to assign a shortcut to this ... In TB8 I used to assign the Ctrl + shift + N shortcut to this functionality, allowing to instantly type notes in a thought. 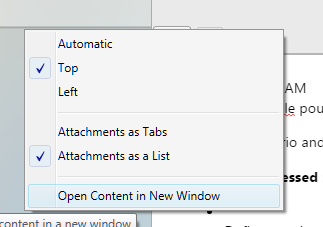 I just realized that a right click (under window) on the top of the editor menu you get the option to open the editor in a new (floating) window! Actually, this opens a window that displays a lot more than the Notes editor. It's a new window for your current brain, with the Plex hidden. Notice that you still have the full menu, toolbar and Search area, along with your list of attachments and access to the Report area and the Timeline. Yeah ... this sort of works but you end up with a pile of open windows on the second monitor.